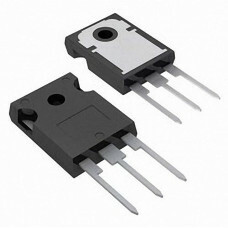 The HEXFET technology is the key to international Rectifier's advanced line of power MOSFET transistors. The efficient geometry and unique processing of this latest "state of the art" design achieves: very low on-state resistance combined with high transconductances; superior reverse energy and diode recovery dv/dt capability. The HEXFET transistors also feature all of the well established advantages of MOSFETs such as voltage control, very fast switching, ease of parallelling and temperature stabilty of the electrical parameters.